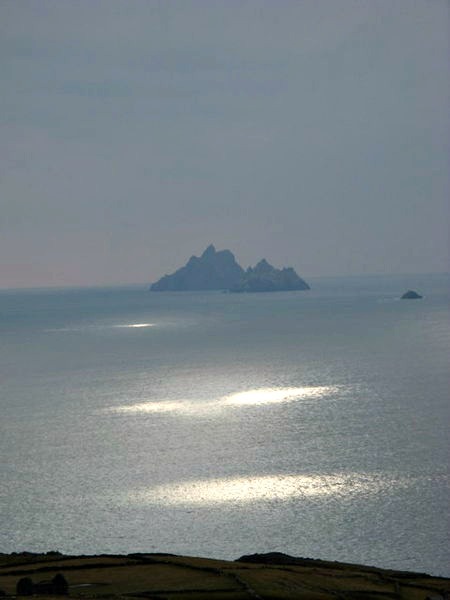 A deviation well-worth making away from the Ring of Kerry to the West will take you to the spectacular Skellig Islands. Sitting in the Atlantic Ocean, almost eight miles off Bolus Head, off County Kerry’s lveragh Peninsula, these 2 remote islands rise out of the water like Medieval Cathedrals, their magnificence is truly beyond compare. There is no doubt that these spectacular places are among the top places in the world to visit and if you Haven’t already done so, you should really put it on your ‘Places To See Before I Die List’. Far from being manmade, the Skellig Islands are unique and dramatic rock formations made from 350 million year old Devonian sandstone. The Skellig Islands compromise Great Skellig (or Skellig Michael) and Little Skellig (Skellig Beag). Each island is world famous in its own right and for different reasons. The importance of Skellig Michael, the monastic settlement perched on the steep rock-face cannot be underestimated. This unique place has provided a spiritual focal point to countless thousands for many centuries and continues to do so today. Skellig Michael or Sceilig Mhichil as it is known ‘as Gaeilge’ is one of only two sites in Ireland which have been designated by UNESCO as having ‘World Heritage Site’ status, due to its “outstanding universal value to humanity”. It is one of a number of rock like structures associated with the European cult of Saint Michael The Archangel. Mount St Michel in Brittany and Saint Michaels Mount in Cornwall are of the same creed. It is a unique example of an early religious settlement preserved due to its remarkable environment. It illustrates, as no other site can, the extremes of a Christian monasticism. The Island was the chosen destination for a small group of ascetic monks who, in their pursuit of greater union with God, withdrew from civilization to this remote place sometime between the 6th and 8th century. A monastery was constructed on the North Eastern summit of the island. In the traditions of the early Hebrew Christians and the "desert fathers" of North Africa, they took to a life of privation and contemplation, sustained by little more than seaweed and birds' eggs. During the life time of the monastery a hermitage, one of the most daring architectural expressions of early Irish monasticism, was also created on the narrow ledges just below the summit of the South Peak, the highest point on the island. The trip to the Skelligs and back takes about three and a half hours. For all of that time you will be surrounded by the sounds of gannet, wave and pilgrim. You will climb steps chiselled by eighth century monks using basic tools. It is hard to imagine why the early monks, of no particular religious order, chose this inhospitable, daunting site on which to eke out a livelihood. Of course these were ascetic monks who dedicated their lives to prayer and meditation. And what better place than this hard outcrop of Sandstone, 7 sea miles, a day’s row from the mainland. Very few facts are available concerning these early fathers but legend and surmise abound. It is said that the monks traded birds’ feathers, eggs and sealskins for tools and vellum from passing ships. Faulting of Devonian sandstone and gravels has created a U-shaped depression, known today as 'Christ's Valley' or 'Christ's Saddle', 130 m above sea level in the centre of the island, and this is flanked by two peaks, that to the north-east rising to 185 m and that to the west-south-west 218 m.
The rock is deeply eroded and weathered, owing to its exposed position, but is almost frost-free. Landing is possible at three points, depending on the state of the sea. These communicate by flights of steps with the principal monastic remains, which are situated on a sloping shelf on the ridge running north-south on the north-eastern side of the island; the hermitage is on the steeper South Peak. Your approach from Portmagee presents you with a magnificent view of the monks’ steep route which rises above Blind Man’s Cove and climbs perpendicularly, up towards their monastic settlement strategically placed, to avoid, the cold North winds, on the 217m high Southern Pinnacle. In the centre of the church is a graveyard belonging to the Lighthouse families of 1868, the monks’ graveyard lies beyond the window frame. Beehive huts comprising a kitchen,	two oratories and sleeping cells cluster around the central passageway. A look inside one of these demands that you stoop low, feel a drop in temperature and readjust your vision to the dark interior. The enemy was not only the Atlantic Ocean and its turbulent weather that would have cut the island off from any communication for months on end. The monks were also subject to raids by the Viking ships which made the waves their own particular element. These invaders are reported to have carried away Etgal, the abbot of Skellig Michael and starved him to death in AD823. But monastic life persisted here despite the obstacles until the 17th century when the monks sailed for the shores of Kerry and settled in Baliinskelligs. On Skellig Michael most of the birds cling tenaciously to rock ledges but some are easily coaxed by fruitcake to present themselves for a closer inspection. 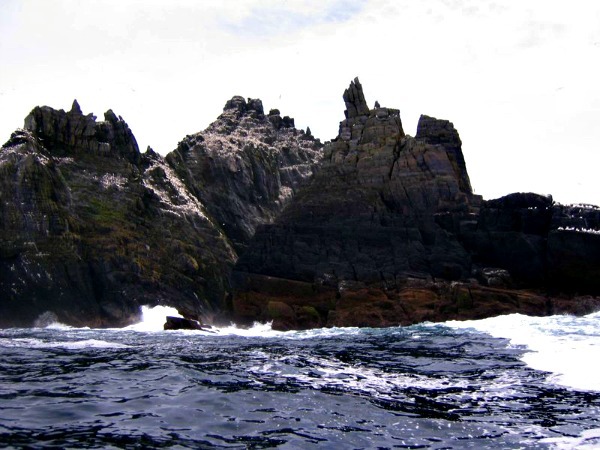 Although the expedition to the Skelligs is not for the faint-hearted, the trip to is a manageable excursion for most. The boat journey from Portmagee takes 50 minutes. A two and a half hour stop gives you plenty of time to climb those 600+ steps and still enjoy a sandwich in whatever flat perch you can find. Here you have a bird’s eye view of the neighbouring Little Skellig (Skellig Beag) bird sanctuary and the Kerry coastline. The ferry takes you for a twirl around the bird sanctuary. Skellig Beag is lauded for the unique myriad of flora and fauna that inhabit its slopes providing, among other things, a home for the world’s second largest colony of Gannet. The Gannets of the Little Skelligs are truly amazing. The whole Island turns white in the summer months from the vast number of Gannets nesting there (27,000 Pairs), and from a distance it almost looks like the Island is covered with Snow but of course it is not. The colony on the Small Skelligs is the largest in Europe and is one of only 3 in Ireland. The other two are 25km to the south-east on Bull Rock, and on the Saltee in the south-east but numbers of Gannets there are tiny in comparison to the Skelligs. Other species to be seen include the razorbill, the fulmar, the guillemot, the kittiwake and, of course, the puffin. Grey seals bask on the surrounding rocks and basking sharks have been sighted offshore. Then it is back to Portmagee. You will have accomplished an attempt that countless other pilgrims before you have attempted down through the ages. You will find your-self in the splendid harbour town of Portmagee. You can head for The Moorings where you can enjoy the best fish in town, any number of ancient and astonishing places to visit in the vicinity, pubs to gather in and stories to hear. We wanted to visit Skellig Michael and tried to book online but all seemed booked up ! When we arrived in Portmagee we enquired from locals about getting on a boat trip that landed and not just a boat trip around the rock. We were told to go to the pier at 8.30 the next morning and maybe we could get on a boat if there was a cancellation ! So we arrived the next morning and were told to join a queue of 4 other people also waiting for a cancellation ! It was a bit disorganised around the area to board the boats but after 1 hour our luck was in and we were told we could get the last two places ! All I can say is that it a most amazing experience ! 600 steps up a very steep and rocky area yo the monastic site was so worth the effort ! It cost €60 per person and I felt it was a bit expensive at first. But there are tour guides on the island and they were extremely informative. The boat trip took 1 and a half hours and then you stay 2 hours on the island. Great value after all that ! There are no toilet facilities on the island so make sure you sort that before you get on the boat !